We greatly anticipate the release of the Bell Mag 9 Sena Helmet in 2013! Both the Bell and Sena brands are well-established manufacturers in each of their categories and it is a stellar combination to see them work together. Previously, Sena units have been an aftermarket add-on only, in the sense that each installation was essentially a custom endeavor. Their clamp kits are very versatile and fit most helmets, but do not allow for an integrated installation such as the SRC System to the Schuberth or the B4 to Nolan. 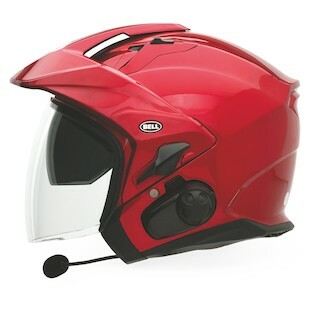 The concept of the Bell Mag 9 Sena is to offer a clean symbiosis between helmet and communicator. While the Sena unit will not come with the helmet, the helmet will feature a Sena-specific cutout that will eliminate the need for a clamp kit. On the interior, speaker pockets will be prepared along with a channel for the microphone. Aside from this innovation, the standard Bell Mag 9 helmet is already a success! Featuring a full-length faceshield and drop-down sunvisor as well as a peak, the Mag-9 comfortably serves cruisers, tourers and commuters alike. The added benefit of integrated communications should only propel this helmet in the new year.